The leaf springs rear suspension. 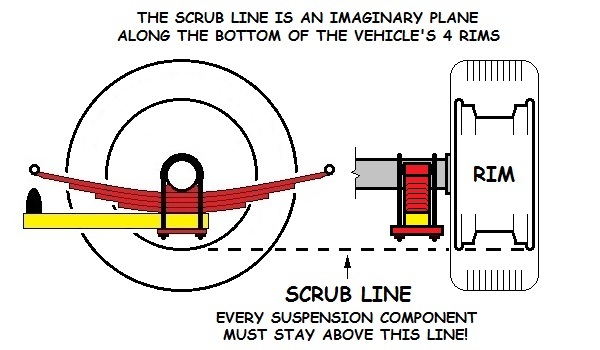 The oldest and probably simplest suspension system out there. 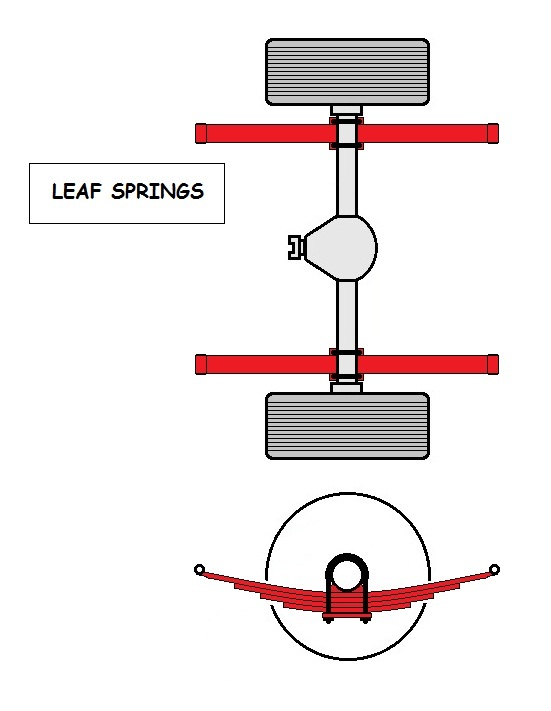 The leaf springs locate the rear end in the chassis and support the weight of the vehicle. Most all car companies have used them at one time or another. They're still standard on some models today. Disadvantages: Sometimes limited in terms of serious racing. Extreme cornering can lead to some lateral movement, although changing out the bushings to better aftermarket ones will usually cure it. In exteme cases, you can also use a panhard bar or Watt's link to keep the axle from moving side to side. Ok, so how do I lower my ride with leaf springs? There are a variety of ways to lower a leaf spring rear end. 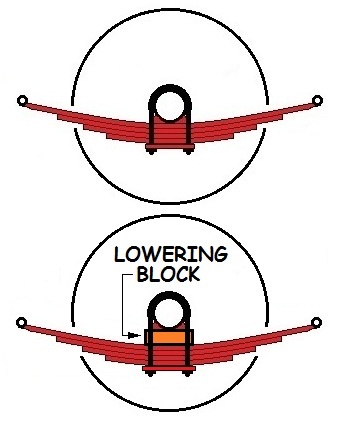 Lowering blocks, flipping the axle, longer or shorter shackles, relocating the spring anchor points, or de-arched springs or lowering springs. Lowering blocks, while probably the cheapest way to go can also lead to bad handling. Especially acceleration and braking. Think bad wheelhop. Never go over a couple of inches. This method is more for looks than performance. New de-arched springs or lowering springs are usually the way to go. 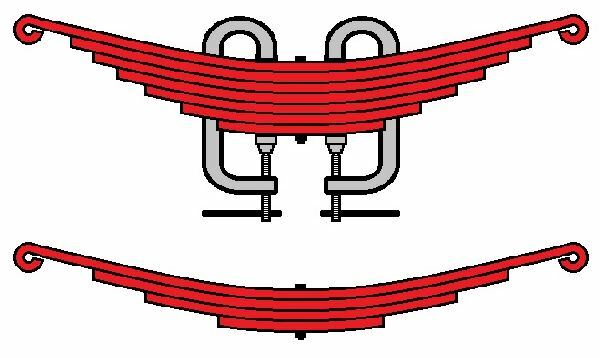 To de-arch a leaf spring, you can remove a few of the leafs in the spring pack, or physically de-arch the main spring in the pack or a few of the main ones. You can lower a spring pack by removing a few of the leafs. First you have to disassemble the spring pack. Use C-clamps and lots of caution! Clamp the springs in the middle on either side of the bolt that holds them together, remove the bolt, then carefully loosen the clamps. Spring packs have a lot of stored energy, so Be Careful! Now keep the main leaf, remove the second, keep the third, remove the fourth, etc. until you're satisfied with the drop. Now reassemble. You can also take the spring pack to a local suspension shop and they can de-arch them for you (recommended). You can also do it with a shop press. First disassemble the spring pack. Now take the main leaf and use a shop press to slowly flatten it out. Work along the entire length of it and go back and forth evenly flattening it. When you have it where you want it, make sure you make the other main spring from the other side of the vehicle match it. You may want to do this to a few of the longer leafs in the spring pack. Now take those C-clamps and compact the leafs back into a pack and re-install the bolt that holds them together. 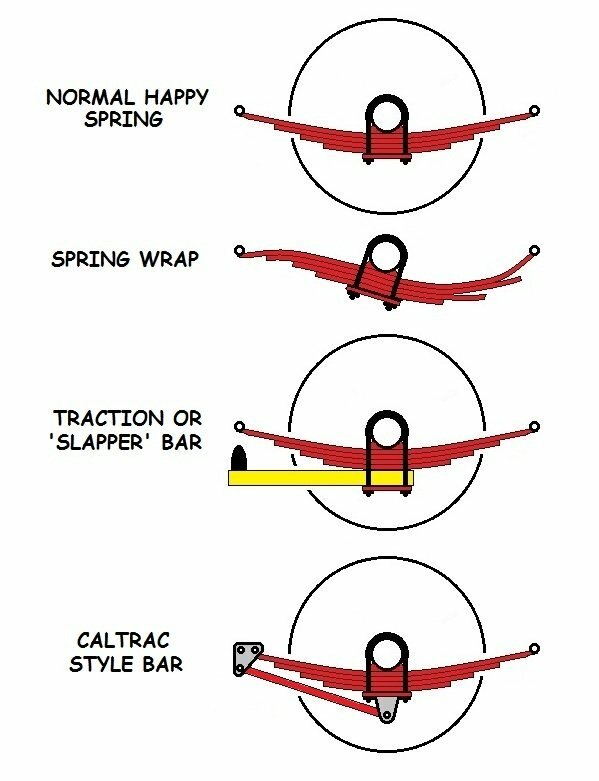 Sometimes it can be very cheap to use springs from other models of vehicles may work depending on your car. That's why it's so important to research your particular car on the internet. There's clubs that already have your particular questions answered. They already know the best and cheapest way to lower your car.